Action folds to Glen Minxolli on the button who moves all in for around 750,000. It folds to David Gunas in the big blind who looks at his cards and quickly calls. The board runs out 8♥7♥7♣5♦7♦ awarding Gunas the pot, and eliminating Minxolli in 6th place. Sam Taylor is all in holding A♦K♦, and has been called by Will Chadwick holding A♥A♠. The board runs out Q♦9♦2♥4♣3♣ awarding Chadwick the pot. After a close count, it's determined that Chadwick has Taylor by a small margin, and Taylor is eliminated in 7th place, taking home $4,328. Mark Perry was just eliminated by Joseph Acquavella when he lost a massive flip holding Q♥Q♦ against Acquavella's A♣K♠. Acquavella flopped a king, and Perry was unable to improve. Acquavella is now the chip leader heading into the final table. Vito Masi moves all in for 330,000 and Sam Taylor moves all in over the top. on the button. The board runs out A♦8♠6♥J♣A♠, awarding the pot to Taylor and eliminating Masi in 12th Place. Glen Minxolli moves all in for 366,000, and Vito Masi tank calls, having Minxolli slightly covered. The flop comes A♠9♠4♠, gibing Masi the lead when he makes a pair of aces. He maintains that lead when the turn comes the 9♣. "Don't worry, it's coming," a player at the table says to Minxolli, just before the river comes the J♠ giving him the flush to double up. "Yesss..." Minxolli says, "Sorry, I just never win those." Vito Masi is all in from the small blind, and Glen Minxolli has called in the cutoff. Masi is in good shape holding 10♦10♠ against Minxolli's 3♠3♦, but only until the 3♣ shows in the window (followed by the A♦, and J♣). Masi stands up in his chain in preparation of departure as the 9♣ arrives on the turn, but the 10♥ on the river gives Masi a bigger set, and causes him to say, "Yessss," in celebration. Players will now head out on a 60-minute dinner break. There were a total of 136 entries in today's $300 No-Limit Hold'em Big Stack Bounty event, generating a prizepool of $32,571. The top 15 places will make the money, with first place taking home $8,729. Justin Carey moves all in from the hijack for 114,000. It folds to Jose Tronilo in the big blind who thinks for over a minute before calling. The board runs out 8♥3♠2♥4♥Q♣, giving Tronilo a queen on the river to win the hand, and eliminate Carey in 22nd place. Joseph Acquavella is all in from the hijack, and has been called by Andrew Weinstock in the big blind. The flop comes A♠8♦5♣ giving Acquavella the lead when he makes a pair of aces. The 2♠ turn and 4♠ river are safe for Acquavella, and he doubles up. The dealer counts down Acquavella's 354,000, and passes the chips across the table from Weinstock. Edward Ribeiro raises to 12,000 in middle position, and it folds to Adrian Scarpa in the small blind who moves all in for 52,000. It folds back to Ribeiro who thinks for over a minute, counts out the chips needed to call, and then slowly moves them across the betting line. The flop comes 8♣6♥5♠, keavig Scarpa in the lead with his pair of nines, but the A♥ on the turn gives Ribeiro the lead when he makes a pair of aces. "You still have a gutshot," a player at the table says encouragingly to Scarpa, but it's the A♣ that arrives on the river. Scarpa is eliminated in 46th place, with 45 places paid. All remaining players are now in the money, and guaranteed at least $763. There are 46 players remaining, ad 45 of them will make the money. The hand-for-hand portion of play will continue until the field is thinned by at least one player. All remaining players will then be in the money and guaranteed at least $763. Calvin Ma moves all in from under the gun for around 17,000, and it folds to Alfonso Santana in the cutoff, who also moves all in (for around 55,000). All remaining players fold. The flop comes 9♥9♣6♦ giving Ma a gutshot straight draw, but leaving Santana in the lead. The 7♦ turn maintains that lead. Unfortunately for Ma, the 4♣ on the river is of no help, and he is eliminated from play. After some technical difficulties this morning, the feature table live stream is now back up and running. Tune into Twitch.tv/foxwoodspoker to watch all of the action as it unfolds throughout the day, and as we play down to a winner later this evening. Receive a player's $100 bounty chip when you knock them out. Of the 71 players remaining, 45 will make the money. There are 25 players advancing to Day 2 from Flight C of the $6400 No-Limit Hold'em Multi Flight Re-Entry event. The 25 players listed below will join the 14 that advanced in Flight A, the 12 that advanced in Flight B, and the 20 that advanced in Flight C. Day 2 play resumes at 11 am on Friday May 4th. 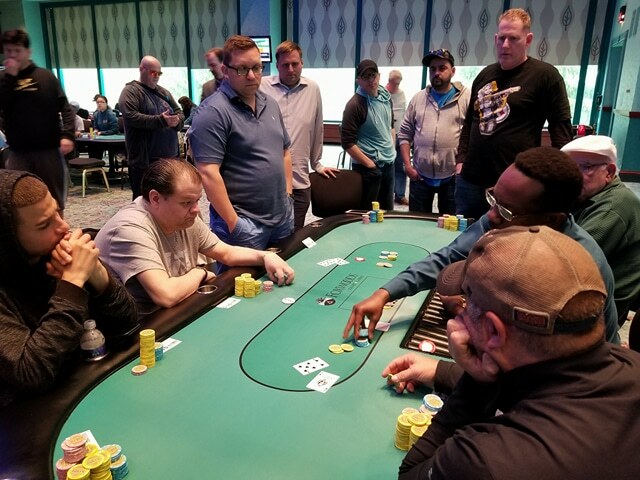 Jose Tronilo bagged the chip lead of Flight D in the last hand of the night when he got it all in holding pocket kings against Corbin Avery's pocket queens. Avery was unable to improve and was eliminated from play, while Tronilo was propelled to the chip leader of the final flight. ***A list of table/seating assignments will be posted in the next few hours. It's the last hand of the night on the feature table. Tim Kelliher opens to 6,000 in late position, and Corbin Avery raises to 15,500 in the small blind. Jose Tronilo moves all in from the big blind for around 100,000, and Kelliher quickly folds. Avery thinks for a bit before ultimately calling for just about the same size stack. The board runs out 8♣5♠5♥4♥3♣, awarding Tronilo the pot. After a close count of chips, it's determined that Tronilo has Avery covered by a small margin, and Avery is eliminated from play. The floor is now handing out bags to the remaining players. Those making it through will return tomorrow (Fri. May 5th) at 11am to play Day 2. The clock has been paused with ten minutes remaining, and the remaining players will now play six more hands before bagging and tagging for the night.